G Suite is a comprehensive suite that combines GMail, Google Drive, and a number of other valuable tools created by Google to manage productivity. 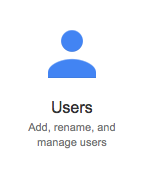 The G Suite Admin Panel is the primary tool to manage your in-depth settings, preferences, and user information. 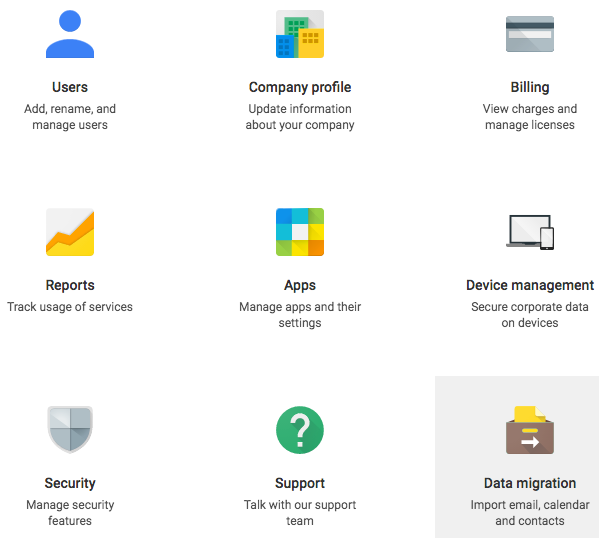 This article will take you on a tour of the G Suite Admin Panel. 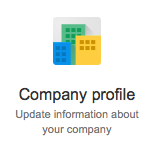 Click the G Suite Admin button in the G Suite page in your Account Center. You will be taken to the login screen for the G Suite panel. Enter your G Suite Super Admin user credentials (NOT your (mt) Account Center login) to continue. 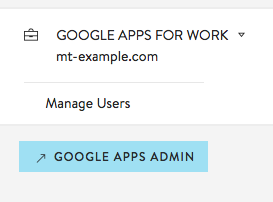 Now you can use the to manage your G Suite users, services, and settings. The G Suite Admin Panel has an extensive number of functions available. You can manage your user and organizational settings with ease through the main console after logging in. The Users tool allows you to add, rename, and manage users and user permissions across your organization. The following details can be edited for each user by clicking through to the user's individual page. This section allows you to update information about your organization. The following information can be updated. Your company name, language, and time zone. Your company logo and other details. A custom web address for a user to access G Suite. This area is used exclusively by G Suite customers outside of (mt) Media Temple. Since you have purchased G Suite through (mt), you will instead want to manage your settings through the (mt) Media Temple Account Center. The Reports tool allows you to access reports for both your users and organizations and conduct audits on individual user or role behavior. You can also manage alert settings for certain types of behavior. Report types include account usage, security, two-factor authentication, and much more. For a detailed overview on the Reports available in the Admin Panel, please see the following article from Google. The G Suite tool allows you to toggle access to various G Suite services at an organizational level. This is useful if your organization wants to disable any particular feature (for example, disabling GChat or Sites for an organization) without editing the settings for each individual user. This tool also allows you to manage sharing settings, preferences, and settings for your enabled apps. 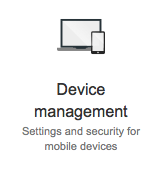 The Device management tool (also called Mobile management) allows you to configure sync and security settings for mobile devices. The following menu items are available. Enable Android, Google, and iOS Sync for your organization, enable Google Glass support, and manage Google Play, CalDAV, and other mobile-related access settings. Activate and approve or block any pending devices that have requested access. Assists you in setting up a certificate to use Push on iOS devices. The Security tool assists you in managing the following security settings for your organization. Activate SSL, set password strength policies, and enforce 2-step verification requirements. Assists you in monitoring password strength per user and determining possible weak links. Configure access privileges for third-party APIs. Set up user authentication for and across multiple web-based applications, such as Gmail or Calendar. Manage OAuth domain key, enable federated login with OpenID, and manage API client access, as well as utilize advanced secure data connection tools for integration with internal services. Both (mt) Media Temple and Google want your G Suite experience to be seamless and easy! Our support teams have joined forces with Google to provide you with an extensive experience should you have any questions. The Support button in your Admin Console will take you to a list of Google-crafted support resources, including the extensive G Suite Help Center. (mt) Media Temple's award-winning 24/7/365 support team is also here to help via chat, Support Request, phone, or Skype. If you need to contact us for assistance, you'll want to do so through the (mt) Account Center. The Migrations tool will help you move your data to G Suite from your previous email provider. For a detailed guide on migrating to G Suite, please see the following article. At the bottom of your Admin Panel, you will find additional, less commonly-used tools that may be useful to you, such as configuring Google Groups or creating a domain alias. Click on More controls to expand the full list of settings in your Admin Panel, and start exploring!